Subtalar joint instability is a chronic functional talocalcaneal instability characterized by a combination of anterior movement, medialization, and varus tilt of the calcaneus. 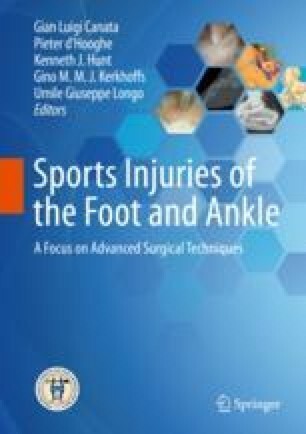 It may result from chronic tear or insufficiency of interosseous talocalcaneal ligament (ITCL), cervical ligament (CL), and calcaneo-fibular ligament (CFL) or as a consequence of acute subtalar dislocation. Clinical symptoms include a feeling of uncertainty during walk on uneven ground, swelling, painful stiffness of the subtalar joint, and diffuse pain in the hindfoot and onto the sinus tarsi. Weight-bearing X-rays including Broden views, CT scan, MR imaging, and arthrography are helpful for the correct diagnosis. Treatment consists of physical therapy directed at the soft tissue envelope and dynamic stabilizers and, if conservative treatment is unsuccessful, operative treatment with anatomical or nonanatomical reconstructions.